This mold appeared on eBay and eventually went for something well over $100. It was a vintage German chocolate mold make by Anton Reiche. Every so often you can find a scooter related mold like this on eBay. Just be prepared to shell out a lot of dough. They tend to go for at least $200. In fact I used to collect these when they were under $50. That was just six or seven years ago! Many are reproductions from vintage European molds and some are original molds. They work great to make chocolates of course but I’ve also used them to make soap molds, Plaster of Paris figurines, Christmas ornaments, etc. You can even make candles if you’re so inclined. Here’s a tip: office binder clips are essential to hold the two halves together as they very seldom come with their original clips. And of course they are also just wonderful to display in the kitchen. 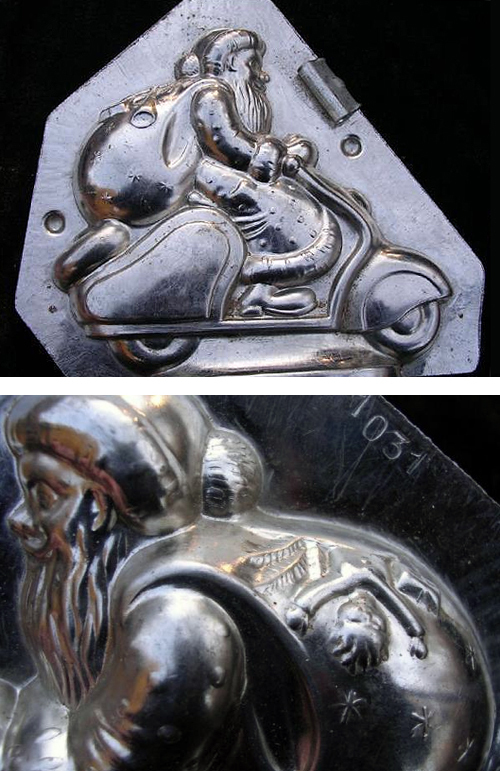 This entry was posted in Ceramics, Pottery, Crafts, Decor, Food, Wine, Holiday, Models, Figurines and tagged candy, chocolate, european, lambretta, mold, scooter, vespa, vintage by Tracy. Bookmark the permalink.